The field of industrial electronics covers a plethora of problems which must be solved in industrial practice. Electronic systems control many processes that begin with the control of relatively simple devices like electric motors, through more complicated devices such as robots, to the control of entire fabrication processes. An industrial electronics engineer works with many physical phenomena as well as the sensors which are used to measure them. Thus the knowledge required by this type of engineer is not only traditional electronics but also specialized electronics, such as those required for high power applications. The importance of electronic circuits extends well beyond their use as a final product in that they are also important building blocks in large systems. Therefore, the industrial electronics engineer must also possess knowledge of the areas of control and mechatronics. Since most fabrication processes are relatively complex, there is an inherent requirement for the use of communication systems that not only link the various elements of the industrial process, but are tailor-made for the specific industrial environment. Finally, the efficient control and supervision of factories requires the application of intelligent systems in a hierarchical structure to address the needs of all components employed in the production process. This latter need is accomplished through the use of intelligent systems such as neural networks, fuzzy systems or evolutionary methods. 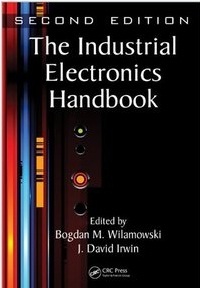 The Industrial Electronics Handbook, now in its second edition, addresses all these issues in five separate volumes which can be purchased individually or as a set: Fundamentals of Industrial Electronics, Industrial Communication Systems, Intelligent Systems, Power Electronics and Motor Drives, and Control and Mechatronics.